PRELUDE: On February 8, 1862, Union General Ambrose E. Burnside captured Roanoke Island, key to the important Sound Region of Northeastern North Carolina. On February 10, Elizabeth City fell followed by strategic New Bern on March 14. Washington was taken on March 20. 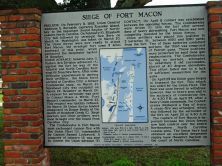 The Union forces were now ready to attack Fort Macon, the strategic fort some 5 miles southeast of this point, which protected the deepwater harbor of Beaufort. UNION ADVANCE: General John G. Parke’s 3rd Division advanced against the fort by way of the Atlantic and North Carolina Railroad from New Bern. After some difficulty experienced in moving their artillery, the Union force arrived at Carolina City, a former Confederate camp, on March 21. 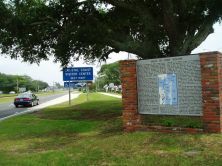 Morehead City was occupied on March 22; Beaufort on March 26. A request for surrender was sent to Colonel Moses J. White, Fort Macon’s commander, on March 23. This request was quickly refused. On March 29 Union forces landed unopposed on Bogue Banks at the mouth ofHoophole Creek. Siege mortars and other artillery were soon brought over the Sound from Carolina City. The Confederates in Fort Macon soon exchanged cannon fire with the Union Fleet, commanded by Captain Samuel Lockwood. A company of infantry was sent to contest the Union advance. CONTACT: On April 8 contact was established between the opposing forces. The Confederates were driven into the fort after several days of heavy skirmishing. Fort Macon was now completely invested by the Union forces. Union artillery was placed into position in 3 batteries, between 1680 and 1280 yards from the fort. Two of these batteries contained mortars; the third was composed of Parrott guns. These positions were protected by sand dune gun emplacements. The Confederates, having no mortars, attempted to substitute 6 old carronades, placed at 40 degree elevations. This effort failed due to a lack of sufficient ammunition for the guns. On April 25 the Union guns began to bombard the fort. This attack was aided by the Union Fleet. The fleet was soon forced to withdraw, however, due to heavy seas and to the accuracy of Confederate fire. At 4:30 P.M. on April 25, after a heavy Union cannonade, the Confederates displayed a flag of truce. A cease-fire was arranged, which was followed by the surrender of the fort on April 26 at 9:30 A.M. The capture of Fort Macon is important because the Union forces now held control over the entire Northeastern North Carolina coastal area. The Union Navy had obtained an excellent deepwater supply base (Beaufort Harbor) on the coast of North Carolina. TROOPS ENGAGED: Union: 4th and 5th R.I. Inf. ; 9th N.J. Inf. ; 8th Conn. Inf. ; 1st U.S. Art. (1 co.); 3rd N.Y. Art. (1 co.). General John G. Parke commanding. Confederate: 10th N.C. Regt. (Art. 4 cos.); 20th N.C. Regt. (Art. 1 co.). Colonel Moses J. White commanding.